In 2002, two young girls and their parents filed a federal class-action law suit against the McDonalds Corporation. It was the claim of the plaintiffs that eating a consistent diet of Happy Meals, Big Macs, fries and shakes had led to their morbid obesity, and McDonalds was responsible for this condition. 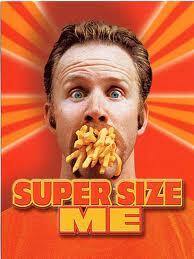 Inspired by these events, independent film-maker Morgan Spurlock produced, starred in, and released a curious piece of American documentary entitled Super Size Me in 2004. The premise was simple: Over a thirty day period, Spurlock conducted an unscientific experiment in which he ate nothing but McDonalds’ food – three meals a day, every day – to see how this would affect his body. When the experiment began, Spurlock was in better than average physical shape. At the end of the McDonalds month, however, things had changed dramatically. Eating upwards of 5000 calories a day, Spurlock gained twenty-five pounds. His cholesterol level climbed past the 230 mark. His liver suffered, holding on to vast quantities of fat. His blood pressure ballooned to 150/110. He experienced mood swings, sexual dysfunction, and heart palpitations. His mother, friends, and physicians begged him to stop, but he kept going, eating in thirty days the fast food equivalent of what some nutritionists say the ordinary person should eat in eight years. It took Spurlock more than year to recover completely. Your body is an amazing thing. Truly, it is fearfully and wonderfully made. Consider that your skin has more than a half-million sense receptors scattered all over it. You have 60,000 miles of arteries, veins, and capillaries. Your heart will spontaneously beat 2.5 billion times over your lifetime. Your brain has 100 billion neurons, and you can have more ideas in your noggin, than the number of all the known atoms in the universe. Your head has 100,000 hairs (well, most of your heads have that many hairs). And the body is so good at healing itself, you completely regenerate over the course of seven years. But the only way that happens, and the only way you keep all that machinery running properly, is by putting the right kind of stuff into it. You need protein, carbohydrates, good fats, fiber, vitamins and minerals, and lots of water. You need good nutrition for the body to be healthy – to get from the body all you can get out of it. And while I personally love a McDonalds fix from time to time, I don’t think we need a class action law suit to inform us that if all you eat is fat, greasy, food, you will end up being a fat, greasy, dude; no matter how many toys are in the little happy box. Spiritually, life is no different. What goes into your mind and heart becomes a part of who you are. If you put in good, healthy stuff, you’ll be good and healthy. If you put in less than that, your spiritual and emotional well-being will show the dysfunction of such a diet. Your spiritual health will break down from poor spiritual nutrition. What your mother and your fifth grade health teacher told you is right on: “You are what you eat” – even when it comes to issues of the spirit. To quote the prophet Jeremiah, once in a conversation with God he said: “When your words showed up, I ate them – I swallowed them whole.” This seems to be exactly what God wants – for us to ingest, as it were, good, healthy, spiritual food. Then his Message becomes a part of who we are, absorbed into our cellular structure, assimilated into our beings, and getting into our bloodstream. There is a lot of spiritual junk food out there. The menu is full, and it looks and tastes great, but it’s not very good for you. If it is all you eat, it won’t take long until you are spiritually obese and woefully unconditioned for the rigors of living in this world. Only in “eating right” – taking God’s Message into our hearts and lives – can we hope to be transformed and grow spiritually.